Elizabeth is a certified Advanced Personal Trainer and Fitness Instructor with over 20 years of experience in group exercise and one-on-one personal training. 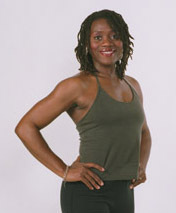 She holds several certifications with the Aerobics and Fitness Association of America (AFAA), the world's largest fitness and telefitness educator. With her background as an aerobic and fitness competition athlete, Elizabeth uses her broad perspective on topics of fitness, health and nutrition to cause and encourage her students and clients to change the way they think about their bodies. Elizabeth strives to educate her students and clients in developing systematic lifestyle changes by increasing their knowledge and information about the body. Her philosophy and the driving force behind her teaching is that fitness must begin with correct thought processes behind what we do. Before you can make changes in the way your body looks you must first change with way you think about your body. Elizabeth is a volunteer for the National Capitol Chapter of the American Red Cross where she teaches health and safety courses. Elizabeth has a background in "Jow Ga" Kung Fu and enjoys working with children through the Best Friends Foundation. Elizabeth lives in Washington, DC with her husband and two children.